Companies today face an unprecedented number of exposures. The frequency and severity of cyber-attacks presents an ever growing threat, and reliance on a complex network of technology and supply chains is expanding. Both trends leave businesses susceptible to a variety of existing and emerging risks. Managing these risks by developing a business continuity strategy is key to the survival of any business, regardless of size or industry. #1: “Our people will know what to do in an emergency.” Even the best employees cannot be expected to know what to do when disaster strikes. Leaving them to respond in their own way only adds to the confusion. Having a well-documented business continuity plan in advance, and training your employees to follow it, gets everyone on the same page — helping to ensure an organised, safe and timely recovery. #2: “We have insurance to cover our losses.” Insurance alone is NOT a business continuity strategy. Proper coverage is a significant and important part of the plan. But it may not fully cover some of the peripheral damages from business interruption, like loss of customers, loss of market share, or setbacks in development and inability to finish projects. You should check with your insurance company to understand exactly what is and is not covered under your policy. #3: “We do not have the time to develop a business continuity plan.” Time spent developing and maintaining a business continuity plan is an investment in your company. Your fixed costs will continue after an event, whether or not you are open for business. The faster you can return your operations to normal, the more likely you will recover from the event successfully. With so much at stake, your company cannot afford to not have a plan. #4: “Business continuity and disaster recovery planning are the same.” Business continuity is a proactive plan to avoid and mitigate risks associated with a disruption of operations. It details steps to be taken before, during and after an event to maintain the financial viability of an organization. Disaster recovery is a reactive plan for responding after an event. It deals with the safety and restoration of critical personnel, locations, and operational procedures after a disaster, and is a part of business continuity planning. 25% of businesses do not reopen following a major business interruption. It doesn’t take a major catastrophe to shut down a business. In fact, seemingly minor disruptions compared to widespread natural disasters can often cause significant damage — power failures, broken water pipes, or loss of computer data. an emergency response or evacuation plan? an IT or data recovery plan? something you developed that sits in a folder on a shelf? If you answered “Yes” to any of these questions, then your business continuity plan may be giving you a false sense of security. An alarming 48% of business owners surveyed by Travelers Insurance said they have no plan in place. 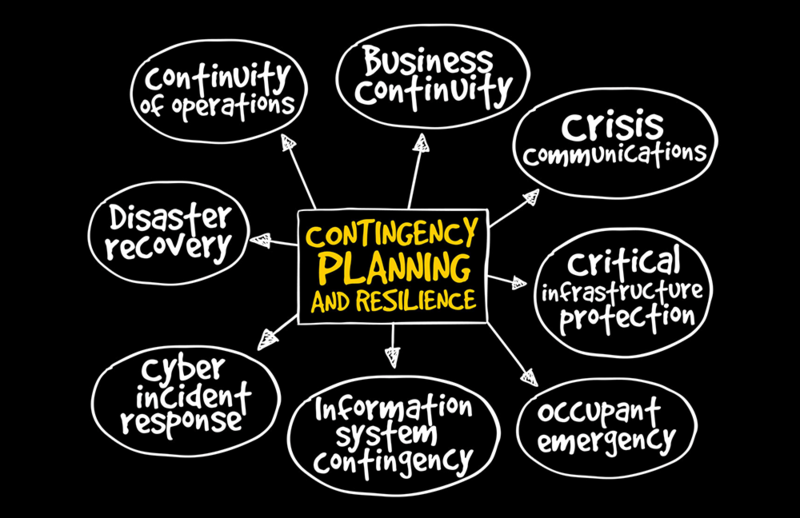 That means business continuity planning is more than smart business — it helps your company remain better positioned to recover from the business interruption, property damage, financial impact, and loss of life that a natural disaster or man-made event may cause. Planning for a disruption or catastrophic event should happen when business is going well, not when disaster strikes. Having a pre-defined, well-documented business continuity plan that clearly communicates how your business will respond during an event can help mitigate risk — and is one of the best investments your company can make. Don’t let your business be needlessly exposed to potentially devastating risks. If you are worried that you have no plan in place or if you think that you would like to check the plan that you have, why not join us at one of our free business continuity planning workshops in London or Surrey? You can find out more about the workshops and register here.